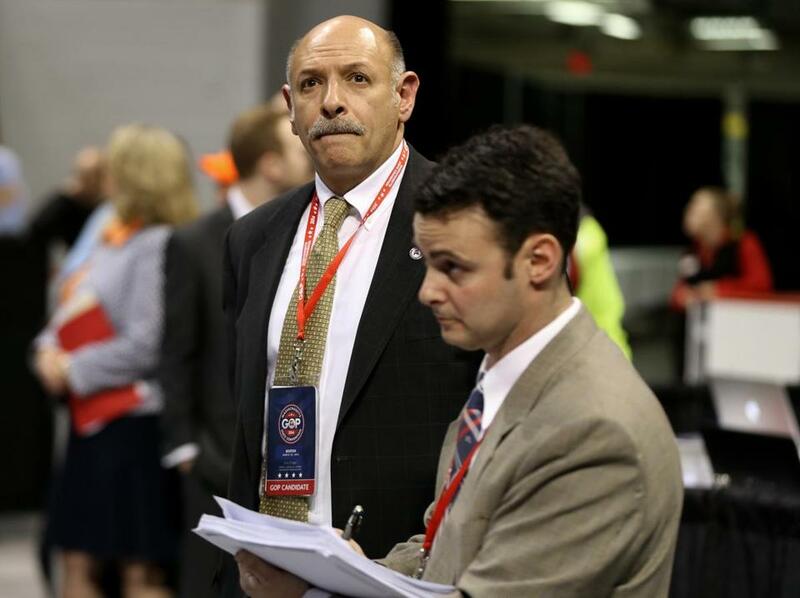 Mark Fisher is seen during the vote count at the state GOP convention. Massachusetts Republican Party officials are accusing Tea Party gubernatorial candidate Mark Fisher of demanding up to $1 million in exchange for dropping his legal challenge to get on the GOP primary ballot this September. In a letter shared with Republican State Committee members Tuesday evening, the party’s lawyer, Louis M. Ciavarra, outlined a series of meetings in which he advised Fisher’s attorney that it is unlawful to pay someone in exchange for dropping out of a political race. “I advised you and your client, as well as my own clients, that . . . in layman’s terms ‘buying people off the ballot’ is illegal,” Ciavarra wrote to Fisher’s lawyer, Thomas M. Harvey, in a letter dated May 6. 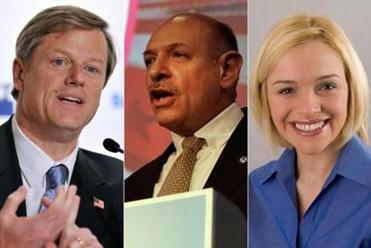 Harvey confirmed Tuesday night that Fisher, who is suing for the right to face off against Republican front-runner Charlie Baker in the fall primary, had asked for $1 million, but said it was only a “starting point’’ in the negotiations. “We’re trying to negotiate a reasonable settlement and you have to start somewhere,’’ he said. Massachusetts Republican activists are engaged in a bitter clash over everything from the party’s leadership to its core values. The attorney said that Fisher’s request for compensation was reasonable and not illegal because the candidate has “put out a lot into this” and should be rightly compensated. Fisher argues that party leaders cheated him out of a spot on the ballot at the Republican convention in March. “Mark Fisher wants to be made whole financially,” Harvey said. According to Ciavarra, Fisher responded to his warnings by lowering his request to $650,000. Harvey said Tuesday night that the $650,000 figure is still negotiable. Ciavarra said the GOP has offered Fisher a spot on the September primary ballot. Harvey suggested that a spot on the ballot was not enough, however. He said Fisher needs to be compensated for what he has been through. In the letter sent to committee members Tuesday, Ciavarra said he gave Fisher a deadline of 7 p.m Tuesday, to agree to the proposed settlement that would place his name on the ballot. Neither Fisher nor his campaign manager returned calls for comment Tuesday night. Fisher, a wealthy Shrewsbury businessman who has financed his campaign with $340,000 of his own money, filed the suit after the party said he failed by an exceedingly slim margin to win enough delegate votes at its March 22 convention to be able to participate in the primary. His legal battle has roiled an already divided Republican Party. Fisher has said party leaders manipulated the delegate counting, although he had several representatives present, including his lawyer. GOP officials noted that the Fisher team did not object to the final results at the time. State chairwoman Kirsten Hughes strongly denies there was any manipulation of the ballot counting. Tuesday night she said she would not comment about Ciavarra’s letter, but noted that Fisher’s private negotiations with the party have not reflected his public statements or his lawsuit, which have focused on winning a spot on the ballot. “Mr. Fisher’s publicly stated goals do not mirror his approach to settlement discussions but we hope to move forward together and achieve an amicable result that we have been seeking for some time now,” Hughes said. Fisher has picked up some support from state committee members who back Baker but feel that the GOP’s image has been tarnished by the allegations that the GOP blocked his access to the ballot. They are urging the party to allow Fisher to run in the primary, arguing that the contest would help the party and the heavily favored Baker by drawing attention to the GOP campaign at a time when Democratic race is dominating the political news. Ciavarra’s descriptions of Fisher’s demands come as Fisher is in a photo finish to meet the state legal requirements that he get 10,000 certified signatures to qualify for the GOP ballot. As the 5 p.m. deadline for filing nomination papers with local city and town clerks passed Tuesday, state election officials said that only 5,143 signatures have been certified so far for Fisher in a state database that keeps a running tally. Local clerks have until next Tuesday to finish the certifications. Fisher’s campaign manager, Debbie McCarthy, said that the campaign had filed another 10,000 still-to-be certified signatures on Tuesday at 288 town and city halls across the state. The judge hearing the case warned that if Fisher fails to get enough signatures, his gubernatorial candidacy would be over and his legal suit would be moot. Meanwhile, several other Republican statewide candidates, including the GOP’s choice for US senator, Brian J. Herr of Hopkinton, and state attorney general, John Miller, an attorney from Winchester, are struggling to get enough certified signatures. Herr, who is the GOP choice to challenge Senator Edward J. Markey, has 6,475 certified signatures registered so far in the database kept by William F. Galvin, Massachusetts state secretary. Miller has 6,489. Both need 10,000. Still the GOP’s signature-gathering this year has been lagging. Galvin, who has overseen state elections for almost 20 years, said after Tuesday’s deadline passed that he has never witnessed such a last-minute scramble by either of the two major parties. “This is a very unusual situation to have so many people at this late date not having ballot status,’’ Galvin said.